Last week we had a bit of an early heat wave so I was looking for a nice cool dish that didn't involve a lot of cooking. Although the boys totally hated these, Vegan Mom and I loved them. The crunch of the lettuce contrasts the vermicelli and rice paper, while the punch of heat from the curry paste is cooled by the cucumber. Yum. Not a real recipe, but here is the stuff I put in mine. Adjust amounts according to how many rolls you want to make. 1. 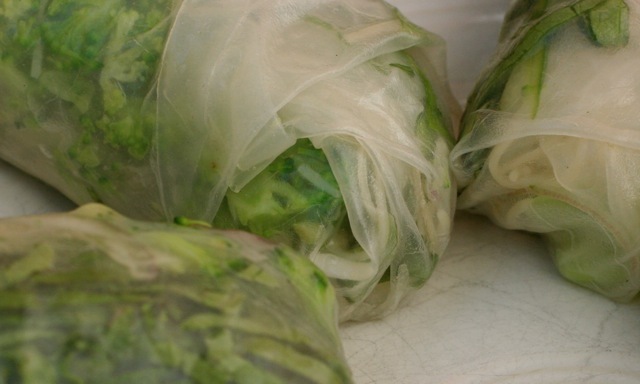 Soak rice paper in warm water as per directions, fill with ingredients, roll like a burrito. Serve with dipping sauce.